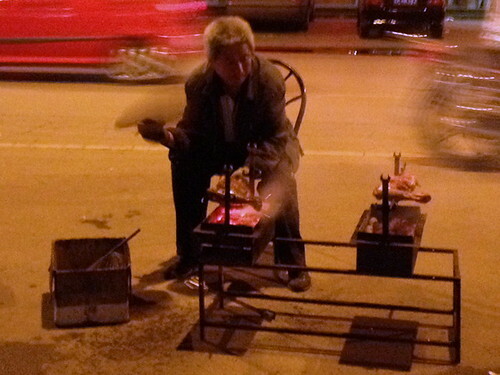 My managers tooks me to a street-side restaurant as a way of welcoming me to the Capital. The weather that day was an excellent breezy one with temperature at around 20 degrees Celsius. So what better way to dine than to do it al fresco. The aroma coupled with the roadside passing cars exhaust was mesmerising as we eagerly wait for the old master to do our 2kg leg proper. So what did we do in the meanwhile? Peanuts and beer lor! 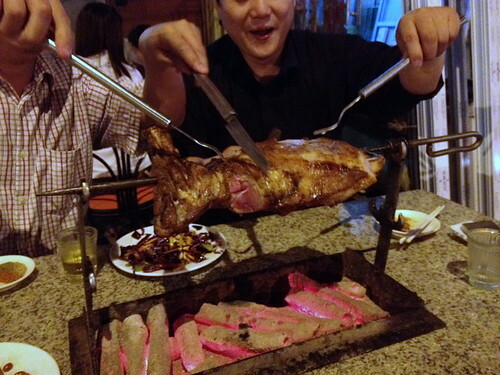 Once the lamb was ready, the old master hauled up the entire charcoal trough and plonked it on our table. We were given extended knives and forks to do our own carving. The cutlery had to extended length-wise as the heat from the charcoal was just too hot to be able to hold our hands over it while we carved. A sprinkle of cumin, a dash of red pepper powder followed by a pinch of white sesame seeds and we were good to go. As we carved, the uncooked insides started to show up and we had to rotate the skewer to carve the other side while we continued to cook the previously carved up side. Once we carved our way to the skewer, the old master will take the remaining leg to the kitchen and chop it up into bite-sized chunks for us to finish up. It was an excellent dinner with the bill with beer and all working out to around RMB 290 (around SGD 58.00) for a dinner of 3.
p.s. The girl in white in the background had way too much to drink that she suddenly started sobbing, much to the embarrassment of her friends who had to carried her back to the car.